Anti-vaccination, HIV-AIDS denier and pro-quackery Mike Adams (AKA The Health Ranger) is the chief engineer of a self-contained world on the Internet. If there is a Wonderland filled with health scares, monsters, and miraculous concoctions, Mike Adams is building it. And its looking-glass is the Internet. Much has been written recently about online “echo chambers”: the idea that we are catered to on the Internet with sites and recommendations that reinforce our preexisting beliefs. If you watch a lot of science videos on YouTube, follow many scientists on Twitter, and regularly search for scientific questions on Google, your online experience will shift away from neutrality, as search results, post sorting, and recommendations will be tailored to your pro-science stance. This is an echo chamber because, in due time, you only hear your beliefs repeated back at you and stop seeing what’s happening on the other side. Echo chambers for the pseudoscience crowd exist as well, though Mike Adams’ online bubble is so vast and self-sufficient, it warrants the term “ecosystem”. Mike Adams, also known as The Health Ranger, is a fierce advocate of alternative medicine. He is anti-vaccination, anti-GMO, anti-medicine. You may know him as the owner of NaturalNews.com. According to the website, its 20 writers and researchers produce up to 15 articles a day. If this massive undertaking already sounds impressive, you may want to know that NaturalNews.com is only the prominent tip of a very large iceberg. A bit of online sleuthing revealed that Mike Adams owns over 50 websites. The topics they cover go beyond alternative medicine and help shape an entire worldview: fear of medicine and science (gmo.news, medicine.news, vaccines.news), anti-Left and pro-freedom hype (campusinsanity.com, libtards.news, freedom.news), and doomsday prep advice (survival.news, collapse.news). On biodefense.com, you will be able to listen to a 45-minute audio clip of Mike Adams instructing you on building an emergency Ebola isolation room at home “after the hospitals are overrun” (never mind that Ebola does not spread easily and that few cases ever made it to North America). On chlorellafactor.com—a webpage dedicated to an algae sold as a superfood—you will be scared into thinking every seller of chlorella wants to kill you… except for Adams who, of course, wants you to know that his store offers Clean Chlorella “even if it means less profit than retailing cheaper, lower-quality chlorella”. While Adams trots out this food source as a defence against cancer, the evidence isn’t there. On consumerwellness.org, you will find a legit-looking portal for a nonprofit that funds educational programs. Press releases on the website claim the Center annually hands out educational grants to aid schoolchildren, expectant mothers, school nutritional programs, and low-income families. Under “Board of Directors”, a single person is named: Mike Adams. There is an invitation to “join our advisory board” but no members are listed. The website was last updated in 2016, though the organization was granted tax-exempt status in 1995. To help bring you back within the confines of this online ecosystem, Mike Adams offers you a toolbar for web browsers so that, regardless of which website you visit, NaturalNews.com is never more than a click away. If you were thinking of searching Wikipedia for a particular food or nutrient, stop. Mike Adams owns NaturalPedia, which offers biased health information such as his page on naturopathy. On it, you will “learn” that it can treat irritable bowel syndrome and ulcers. At the bottom of the page, you will see ads for iodine, magnesium, and colloidal silver because, like the denouement you predict halfway through watching a bad movie, you will have inferred by now that Adams has a store. Digging a bit deeper reveals a weirder complexity to Adams’ ecosystem. Mike Adams has a search engine. If you’re looking for a replacement to Google that “filters out corporate propaganda and government disinformation”, Adams suggests you use Good Gopher. Searching for “Washington Post”, for example, I was not shown the actual website of the Washington Post; instead, I was sent to TruthWiki, RealInvestigations.News, Disinfo.news, and a whole alternate reality in which the newspaper churns out fake news and is beholden to Monsanto. Some of the “independent news websites” that Good Gopher sticks to and that aren’t owned by Mike Adams include far-right website Breitbart.com and Alex Jones’ conspiracy epicentre Infowars.com. Like Google, Adams’ Good Gopher—whose animal mascot, seen holding a magnifying glass, is rendered in reassuring cartoon form—is not just a search engine. It is tied to Gopher Mail, an email service that promises to be “100% uncensored”, whatever that means. Paralleling Facebook, Adams trots out his own social network at https://share.naturalnews.com, hosted by Diaspora (a social network platform created by people who are wary of online service providers accumulating and selling your personal information to advertisers). I joined Natural News’ “online social world where you are in control” using a pseudonym and was instantly met with an article telling me to eat more olives to ward off cancer. Also, ginger is “monumentally superior” to chemotherapy, I was told. Perhaps the most puzzling space of this alternate ecosystem is Adams’ portal to search health topics in the scientific literature. You are invited to enter a disease name, a symptom, a food, herb, nutrient, or therapy of any kind, and you are then shown a list of scientific articles on this topic. The search results, however, belong to PubMed, the search engine maintained by the National Institutes of Health of the United States and widely used by biomedical researchers everywhere. The URL for these search results even includes the PubMed ID number given to every paper it lists. So why not simply provide a link to PubMed for people to search the literature this way? Suspecting a biased, filtering-out of results, a friend searched for the last 300 additions to PubMed on Adams’ portal: they were all there. No evidence of foul play makes this addition to his ecosystem an open-ended question. Raising awareness of this “alternate reality” online is important since the world of alternative medicine can seem, to the casual observer, quite benign. Behind the curtain of empathy and so-called holistic care, however, often lies a darker notion: that modern medicine cannot be trusted. 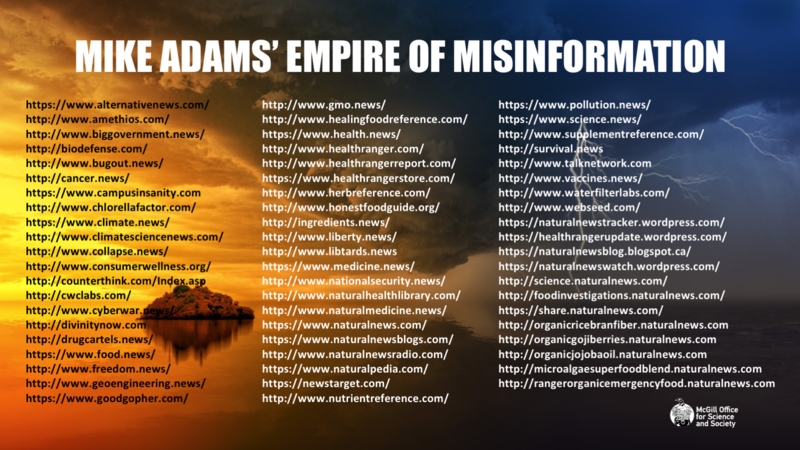 Few alternative medicine proponents reach the near-operatic heights of Mike Adams, but his empire of misinformation has major ramifications. In the age of the digital echo chamber, his voice can be heard even if you don’t go searching for it. His Twitter account boasts 124,000 followers. On the day I write this, he has tweeted about reducing your risk of stroke by drinking full-fat milk; about the chemical bisphenol-A causing gender confusion; and about a woman who cured her cancer with cannabis oil. These tweets lead to his websites, which can be searched via his Good Gopher engine and accessed through his social media platform.